The most common shoulder pain located in the front of the shoulder, or pain that occurs when lifting or grabbing things above shoulder height is due to problems with the Rotator Cuff. Common symptoms of rotator cuff injury or strain are pain and difficulty raising the arm. It is painful for many people to lie on the shoulder when in bed, and many waking up at night with pain in the shoulder. It is painful for some people to attempt and reach behind their backs. Reaching outward and upward can be painful and some feel a lack of strength when attempting to lift objects. The pain may also be associated with degeneration or inflammation of the Rotator cuff tendons leading to Rotator Cuff Tendinitis and what is called ‘Shoulder Impingement Syndrome’, which is caused by repetitive arm movements or long periods with the arm in the one position such as prolonged mouse and keyboard use on computers that irritates and inflames the shoulder bursa. The Bursa are the lubricated bag-like tissues that act to minimize friction and help protect the muscles and tendons when they move against each other. The rotator cuff is a set of tendons, which surround the head of the humerus (the upper arm bone) to hold it secure in the socket and help the shoulder joint function properly. The rotator muscles and tendons help the arm to rotate at the shoulder joint and to provide a full range of movement. The rotator cuff can be injured with a fall onto the arm or by jerking a load over head, or when the arm is pulled downward. Injuries to the rotator cuff can cause a tear that may require surgical treatment as they don’t heal readily. The rotator cuff can also degenerate slightly with age or repetitive use. The pain of Shoulder Impingement Syndrome is due to a pinching action or a rubbing (an impingement) by the tendons causing irritation to the shoulder bursa. 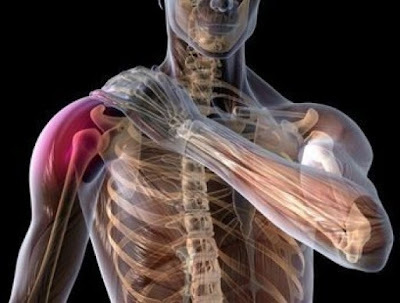 People who work a lot with their arms overhead, poor posture and various athletes who use repetitive throwing motions, swimming and tennis, can cause inflammation of the shoulder tendons and bursa. Poor alignment of the shoulder joint can restrict arm movement arm and decrease circulation. Symptoms of this type of shoulder pain, typically occurring in the front of the shoulder area, are a sharp pain when you lift your arm to front or the side of your body, pain and/or general soreness that developed after repetitive movement or prolonged computer activity and shoulder pain when trying to sleep, especially when lying on the sore shoulder. People at risk for this affliction include athletes involved in throwing and racket sports such as tennis players, baseball pitchers, swimmers as well as people who use their computers for long periods who repetitively reach forward to move their mouse or to type on their keyboard. People who have poor posture when at the computer (such sitting with rounded shoulders or lower arms not parallel with the desk, and who don’t support their wrists may pinch one or more of the tendons in the shoulder region) run the risk of developing these problems especially in old age. Anyone who reaches over head frequently and regularly can develop this problem. This includes swimmers, waiters, window cleaners, painters. Maintaining your arm in a fixed position for prolonged time periods, such as working on computers, office work or hairstyling, especially with poor posture. Sleeping on the same arm or shoulder each night. Playing sports that require the arm to be raised above head-height repeatedly such as tennis, swimming,baseball (particularly pitching) and lifting heavy weights above your head. Degeneration, lack of stretching, lack of exercise, or poor control of your shoulder and shoulder blade tendons and muscles. Poor posture and non-ergonomic seating positions, may over many years cause degeneration or fraying of the tendons that develops into rotator cuff tendinitis, or even tears. Adopting proper postures and using ergonomic workstation designs. Practicing proper postures when working at desks and when using computers. Doing ergocises to strengthen and regularly stretch the muscles of the shoulders and scapular. Taking regular breaks from computer work and regular stretching exercises when working. If you have developed shoulder pain that matches these symptoms and is relatively mild and not long lived, it is worth trying some simple treatments at home. Strengthening and stretching ergocises for the neck, shoulders and back. Installing ergonomic workstation devices and aids and getting advice on posture. Minimizing or avoiding overhead activities at least for a week or more until the pain declines. Applying ice for 10-16 minute intervals for about 3-6 times per day. Massaging the area to alleviate pain. Specific rehabilitative exercises recommended by a doctor. Professional massage therapy and chiropractic manipulation and professional physiotherapy for restoring muscular balance and flexibility.